In cooling towers or some other similar structures, the falling water causes noise annoyances. In such cases some products for sound absorption is needed. There are several type of products but sheet type products are easy to install and it is possible to use needed number of sheets. Enkasonic is one of them. Depending on the number of layers used, Enkasonic can reduce noise by up to 10 dB. The product is made of inert polymers, which are resistant to the aggressive conditions in cooling towers andsimilar environments. So, Sound control is done easily. We can simply devide geosynthetics in below groups. 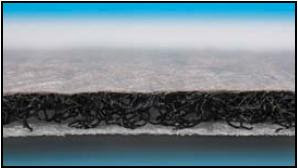 Geocomposites are made by using above product with each other. For example a drainage composite can be made by joining 2 filter fabrics (nonwovens) and a 3 dimensional mats in the middle. With cut and cover tunnels, as with other structures, a long and safe service life is a high priority and is influenced by the design of the drainage system. The installation of geocomposites at tunnel projects is a proven method to drain off water safely and protect the tunnel sealing system. 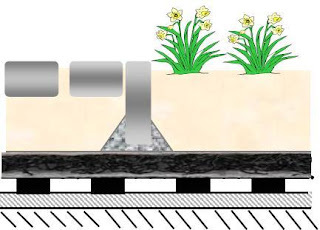 For the use in tunnelling, the Enkadrain product range offers a number of proven and tested drainage mats. Enkadrain can be installed quickly and easily over large areas and be adapted to the most complex geometries. 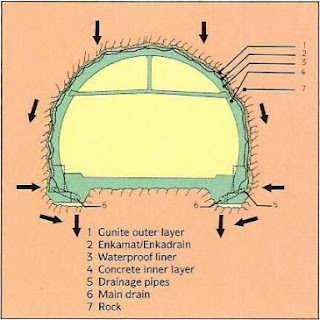 For many years now, different types of Enkadrain have been proving their capabilities in terms of runoff capacity, compression resistance and protection in tunnels and galleries all over the world. Civil Engineers, planners and contractors aim for direct economic highways, airports and other traffic routes using natural resources as efficiently as possible in their construction: this often means having to build on poor soils and sometimes even to reclaim land. In many cases, the sub-grade is too weak to allow construction to proceed at a normal rate. Soft, cohesive soils are very slow to consolidate. 90% settlement often takes 20-25 years without the use of Prefabricated Vertical Drains (PVD's). Prefabricated vertical drain (PVD), provides an economical solution to this issue. 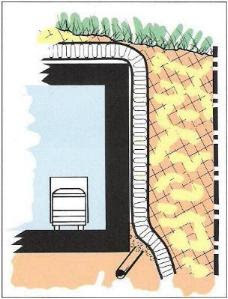 The principle feature of prefabricated vertical drain (Colbonddrain) lies in providing much shorter and highly permeable drainage paths for the dissipation of excess porewater pressure, allowing 90% consolidation in a time period of months, rather than years. For many years now, green roofs are well accepted as a visually attractive and cost-effective method of roof construction, and are becoming increasingly used on account of their advantages in terms of aesthetics, ecology and physical characteristics. Due to their added value related to energy efficiency, the improvement of the microclimate and cutting the peaks of rainstorm runoffs, many city authorities and councils are more and more promoting the use of green roofs. Green roofs can give architects and building engineers more scope for aesthetic design and environmental improvement by reducing the number of hard surfaces in built–up areas. Green roofs retain anything up to 50% of precipitation, spreading the runoff over much longer periods of time. As a result, green roofs can reduce the need for expensive drainage extension works, this helps to the civil engineer cut back construction costs significantly. Roof Garden of Grand Azur Hotel with Enkadrain, a multifunctional layer for the drainage of surplus water, protection and filtration without the risk of clogging. The nonwoven filter layer serves both to protect the sealing layer and as a separator from the substrate. The choice of the right Enkadrain product type depends on the specific roof structure and use. The Enkadrain product range covers a large number of different drainage mats, each designed for a specific purpose. Certain types of Enkadrain are designed for use in extensive or intensive green roofs; others offer effective solutions for construction projects where roof gardens are intended to take vehicular traffic or other heavy loads, making compression resistance essential.